Feast of Laughter is a celebration of the writing of R. A. Lafferty, the Oklahoma Leprechaun, the epitome of sui-generis, the spinner of tall tales, the creator of a modern literary mythos couched in Western, Irish, Native American, Catholic science Fiction. "Other writers are influences. Lafferty is a revelation." New for Volume 5: Reminiscences about how you first discovered and/or fell in love with Lafferty's writing. Reprinted essays, stories, etc. Note: Feast of Laughter is scrupulous about Copyright. We must have explicit permission from the copyright holder to reprint anything. More details on our submission page. Feast of Laughter, Volume #4 - IT'S HERE! The Feast continues! Volume 4 features the first all-new Lafferty story to be published in 14 years, "The Rod and the Ring," as well as a reprint of the very important Lafferty speech "The Day After the World Ended." There is an abundance of new content, essays and appreciations, as well as reprints from science fiction giants, including Gene Wolfe, Robert Silverberg, Gardner Dozois, and Howard Waldrop. Note: Because of copyright restrictions, "Scribbling Giant: An Introduction to R. A. Lafferty and East of Laughter" by Gene Wolfe and "Varieties of Apocalypse in Science Fiction" by Andrew M. Greeley are only available in the print copy of the book. This is a good thing. The authors hold the copyright on these essays and are in agreements with their various publishers that we do not want to interfere with. These arrangements allow us to publish material that would otherwise remain unavailable. The Ktistec press is very strict about respecting the copyrights of the contributors to Feast of Laughter. This means we will never use your contribution in a manner not in accordance with your wishes. In other words, you can trust us to use your work fairly and correctly, so please contribute! At long last, Feast of Laughter Volume #3 is here! "Configuration of the North Shore"
The Man With the Aura - Lafferty's own words! The time is upon us to start assembling Feast of Laughter Issue 3. Email editor@feastoflaughter.org with all your ideas, submissions, stories, artwork, and daydreams of things you'd love to say about R. A. Lafferty, and even requests. Feast of Laughter Issue #2 is here! This issue has more of everything that made Feast of Laughter Issue #1 great. 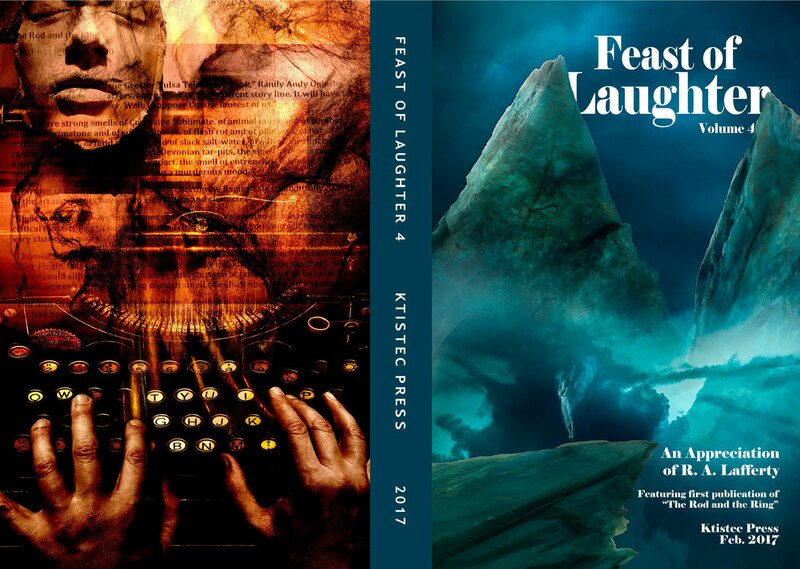 In celebration of Ray's 100th birthday, November 7, 2014, we (the Ktistec Press) have published the First Edition of Feast of Laughter!